The article provides a comparative analysis concerning the war powers of the Executive Branch in the British and in the American experiences; the aim is to understand if the evolution of the constitutional war powers in the United Kingdom could influence the debate on the interpretation of the war powers in the US Constitution. More specifically, the issue concerns the recent constitutional convention that seems to have introduced in the unwritten British Constitution the Parliament’s power of prior approval of the decision to send troops into conflict situations and the possible impact that this important innovation may have on the controversial interpretation of the war powers in the American Constitution. There is, in fact, a profound historical-constitutional link connecting these two legal system and their parallel evolution. TABLE OF CONTENTS: 1. Introduction. – 2. From the Commander in Chief in the Kingdom of Great Britain to the Commander in Chief in the Philadelphia Constitution. The Influence of the British Model in the Configuration of the Power to Deploy Troops Overseas as a Royal Prerogative Power. – 3. The Parallel Evolution of the Constitutional Power of Political Command of the Armed Forces in the British Unwritten Constitution and in the American Living Constitution. – 4. The Genesis of the New Constitutional Convention that Limits the Prerogative Power of the British Government to Send Troops in Conflict Situations to the Advantage of the Parliament. – 5. The Possible Influence of the Evolution of UK Constitutional War Powers on the Interpretation of War Powers in the US Constitution. 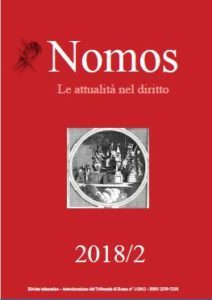 Questa voce è stata pubblicata in: Nomos, Saggi	e contrassegnata con Commander in Chief clause, Elisa Tira, Matteo Frau, Nomos 1-2018, Saggi. Contrassegna il Permalink.